180 and 360 degree cameras continue to increase in popularity, with a number of manufacturers releasing new product in the past year. Sentry360, best known for their 360º line, has now announced two models of 180º cameras to compliment them. In this note, we overview these cameras, Sentry360's novel approach to 180º imaging, and compare to options such as Arecont's SurroundVision, low-cost panoramics, and wide angle lenses. Instead of using multiple imagers or simply wide-angle lenses, as many cameras do, the FullSight180 series uses a single imager with panoramic lens, dewarping the view in the camera, and cropping to a custom resolution. Maximum resolution is 2560x1800 (4.6MP) in the FS-IP4180 and 3840x2100 (8.2MP) in the 8180. Note that these resolutions are non-standard, not 4:3 or 16:9, and may not fit standard client viewing panes. We discuss this topic and associated challenges in our aspect ratio overview. No client-side dewarping is required, as the video is transmitted dewarped from the camera. H.264 and MJPEG streaming are supported, with maximum frame rates of 15 and 6 in the 4180 and 8180, respectively. VMS integration via ONVIF is supported. Aside from this custom dewarping, FullSight 180 models share most features with the FullSight 360 series. 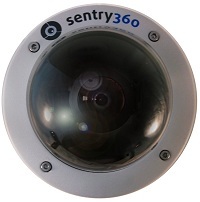 Users may see our overview of the Sentry360 line for more information. The FS-IP4180 and FS-IP8180 are projected to be available in Q3 2012, with MSRP pricing of $1,295 and $2,395, respectively. Based on approximate dealer discounts, we expect street pricing of about $1,100 and $2,000 for these models. Wide-angle lenses: Super wide angle lenses such as Theia's SY125 have become more popular options for covering wide fields of view, but generally top out at about 135º, as opposed to a true 180º FOV. Compared to using a Theia lens ($440 MSRP, $400+ online) with a 5MP camera such as the Arecont AV5115DN (~$550 online), Sentry360's FS-IP4180 is modestly more expensive, around $1,100 vs. $950-1,100. However, the FullSight 180 camera provides a full 180º FOV, and may be mounted flat to the wall, requiring no other hardware. 360º panoramic cameras: A number of lower-cost camera manufacturers, such as ACTi and Vivotek, have released 360º panoramic cameras in the past year. These cameras are generally priced below the FullSight 180, in the range of $700 or less online. Most of these cameras may be mounted flat to walls, similar to the FullSight series, and used in a 180º panorama mode. While some of these panoramic models require custom integration in the VMS client, many offer the ability to dewarp a 180º FOV in the camera, effectively the same as the FullSight 180 series. Multi-imager 180º cameras: 180º cameras using multiple imagers have gained in popularity over the past 1-2 years, with Arecont's SurroundView line being especially popular. Arecont's 8MP SurroundView 180 sells for $1,300-1,400 online, about $600 less than the FS-IP8180. Arecont has a horizontal resolution advantage vs. the 8180 (6400 vs. 3840), but Sentry360 offers more vertical resolution (2100 vs. 1200). Users should keep this in mind, depending on what field of view is required. Lastly, some operators may find tracking subjects much simpler using the single-imager Sentry360 camera, instead of tracking across four separate imagers in the Arecont camera. Ultimately, the FullSight 180 series takes some steps to simplify integration of wide angle cameras to VMSs. However, they come at a price premium above other options. Whether they are best suited for a user's site or not depends on the field of view required, VMS being used, and operator preferences, as discussed above, factors which should be carefully considered.